You will need Barrels for your dog to run around. You do not want 55 gallon barrels for a 20 pound dog. But if you are creative you will find something the right size for your dog. You might use three small empty metal watering buckets, or three over turned plastic 5 gallon buckets. Or you might use traffic cones or overturned small to medium trash cans. You want something that if run into by either you (training) or the dog would not get hurt on. Flower pots could be used, but are not advised. Laundry baskets might work, unless it is a windy day. For very small dogs, large empty up side down, vegetable cans might work. You can decorate your barrels to look better for training or even just to mark them as yours so that family members won't run off with your training devises. Some items you will be able to paint others you could cover with fabric. Remember when you take photos, cuter, fancier barrels are better then a rusted out item. Your barrels are set up in a clover leaf pattern (photo coming) and set closer at first when you start training then they will be later in training and or at competitions. This is the current settings for Dog Barrel Racing. I am going to recommend that for smaller dogs the barrels or the pattern is set closer together. 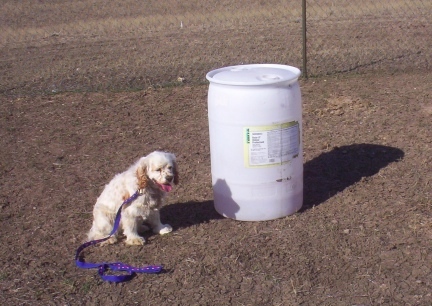 When you first start training your dog, place the barrels close together in a triangle. My training barrels are set at approx. 20' apart. As your dog gets better and better in training sessions, you move the barrels out a little at a time. Some dogs will do anything, aren't afraid of anything, won't pee on new items. But most, well. Some dogs are going to need to be introduced to the barrels. You will need to walk them around the barrels on leash. Let the dog sniff the barrels, or whatever you are calling barrels, but NEVER LET A MALE DOG EVEN BEGIN TO LIFT IT'S LEG! Once the dog is comfortable around the barrels real training begins. If your dog is leery or afraid of the barrels DO NOT BABY THE DOG. If the dog receives this type of attention from acting afraid of the barrels you are teaching the dog to be afraid of the barrels and probably everything else. Just tell the dog "it's ok" and keep working the dog near then closer to the barrels. What If They Are Peed On? CLEAN THEM! Or your dog and every other male dog will stop to sniff and lift their leg on it again. It is a good idea, when working with a group of dogs or if you own a male dog to have a soapy water bottle and or a bucket or soapy water with cleaner and a roll of paper towels for just this sort of thing. Really wipe down that barrel and it's bottom with soapy water, rinse if you can and maybe even dry it. Move the barrel at least a few inches after it is peed on. Another idea is the male dog belly strap, a diaper for male dogs. Dogs should not go potty any where near the Barrel Pattern. You should establish an area for them to go. Dogs are dogs are dogs. Take your dog to that area before starting to work with or on the barrels. It is part of Barrel Race Dog Training to teach the dog NOT to lift a leg on the barrels or to use the area for a toilet at all. It is going to happen, you or your dog brushing up against a barrel at a fast rate, the wind blows, or the dog jumps up on one, the barrel will fall. The truth is, that is what you want, for the barrel to fall away from you rather then a hurt foot, or shoulder or head. When a barrel falls IGNORE IT AND KEEP RUNNING. Try to hold the dog's attention. IF the dog spooks from the falling barrel do not baby or correct the dog, quickly tell the dog "everything is ok" then go right back to where you were. 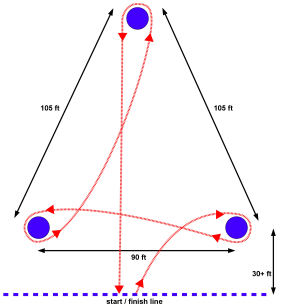 When the "go" is over, set the barrel back up and have the dog run the pattern again. What ever you are using for your dog to run around, and especially if you are fortunate enough to own "actual dog sized barrels", Take Care Of Them. Be sure to keep them clean and nice. Put them indoors when they are not in use, if you can at all, especially in the winter months. Keep them out of full sun during the full summer. Don't let your barrels blow away in the wind. And if you can at all, don't use them for other uses. Otherwise. Your dog may not have barrels to run the next season you are ready to train for fun or competition.